The scenic view of the New River Gorge and the beautifully designed amphitheater in Grandview has attracted over one million outdoor music lovers. Theatre West Virginia is making musical magic under the stars this summer. 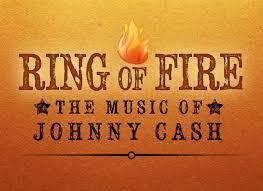 Catch the final show Ring of Fire, The Music Of Johnny Cash, July 20-24th and July 26th-30th. Tickets, group discounts, and reservations can be arranged by visiting http://www.theatrewestvirginia.org or by calling the box office at (304) 256-6800. Ring of Fire performs the music of the legendary Johnny Cash while also preserving the memory of the country music icon known to millions as the Man in Black. The Ring of Fire cast includes 18 musicians and is directed by Neal Seibel with musical direction by Rick McNeely. Ring of Fire was originally imagined by William Meade and created and directed by Richard Maltby Jr. Many of Johnny Cash’s biggest hits from 1955 to 2002 will be featured including “Country Boy,” “A Thing Called Love,” “Five Feet High and Rising,” “Daddy Sang Bass,” “I Walk the Line,” “I’ve Been Everywhere,” “The Man in Black,” “Hurt,” and of course “Ring of Fire.” Production follows Cash’s journey from country-boy idealism, through the struggling musician’s obstacles, and onto a path of spiritual beginnings. Director Neil Seibel began his career at Theatre West Virginia and has gone on to positions Off Broadway and with Mill Mountain Theatre, Denver Center Theatre Company, Arvada Center, Theatre Aspen, Colorado Springs Fine Arts Center, Colorado Shakespeare Festival, Montgomery Ballet, The Alley Theatre, Theatre Under The Stars, and Actors Theatre of Louisville. Neil currently teaches theatre at Auburn University Montgomery. Every performance Theatre West Virginia hosts is just minutes away from downtown Beckley West Virginia at the Cliffside Amphitheatre located at 4700 Grandview Road in Beaver, WV. The amphitheater is inside Grandview Park along the New River Gorge National River. The scenic view of the New River Gorge and the beautifully designed amphitheater in Grandview has attracted over one million outdoor music lovers. Visitors to the area enjoy world class whitewater rafting, the Beckley Exhibition Coal Mine, Tamarack of West Virginia, Glade Springs Resort, and many more fun-packed summer activities. Beckley is easily accessibly by interstates 64 and 77, Beckley Raleigh County Airport with a daily non-stop service, and Amtrak’s Cardinal train service. For tickets, giveaways, meet-n-greets, and on-air interviews, please send all requests and inquiries to Sabrina Berman via email at Sabrina(at)allenmediastrategies(dot)com or by calling (703) 589-8960.